Please refer to our stock # 3319 when inquiring. 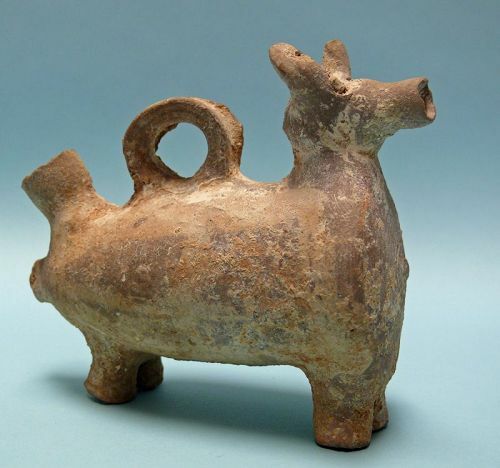 Byzantine Terracotta Juglet, Figure of a Bull / Zoomorphic. ca. 500 - 800 CE. 4 1/2" x 5 1/2" x 2 1/4". Rare, and in excellent condition. Ex: Archaeological Center, Tel Aviv. The Byzantine Empire was the continuation of the Roman Empire in its eastern provinces during Late Antiquity and the Middle Ages, when its capital city was Constantinople (modern-day Istanbul, which had been founded as Byzantium). It survived the fragmentation and fall of the Western Roman Empire in the 5th century AD and continued to exist for an additional thousand years until it fell to the Ottoman Turks in 1453.